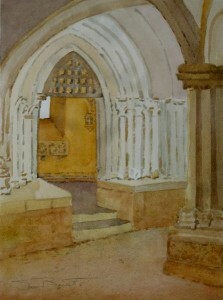 This show represents 15 years of gratefully painting on location in France. Standing at an easel in Rodin’s Sculpture Garden in Paris was a moving and challenging experience: In front of me was the sculpture of The Burghers of Calais. 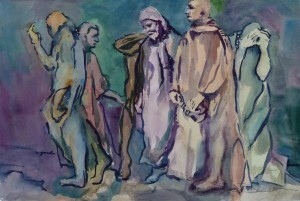 People watched to see it interpreted in watercolor. In countless locations, I’ve loved painting peaceful scenes of beauty and charm: villages, mills and landscapes. Seeking out countryside subjects that speak to my heart has become a passion. I am full of awe and appreciation for the influence of the French impressionists in my own love of art. Painting gear for watercolor is easy to carry, a necessity because the trips include planes, trains, busses, cars and miles of walking. I’ll soon return to a favorite farm near Bergerac; then leave there to explore a new area hoping to capture more antiquity of this country.